The reason for the black screen is because of the "Video Acceleration Function (Overlay output)". To solve the problem, please see the below instructions. 1. Start Bandicam before the recording target. While Bandicam is running, Bandicam shuts off the overlay output. If Bandicam is running, the streaming videos will not be played through the overlay output. 3. Windows Media player can show the black screen when playing the recorded video. Uninstall a codec pack or try VLC/POT media player. 4. If you use 'Screen Recording' mode, try 'Game Recording' mode of Bandicam. - Video Tutorial: How to use 'Game Recording' mode. 5. 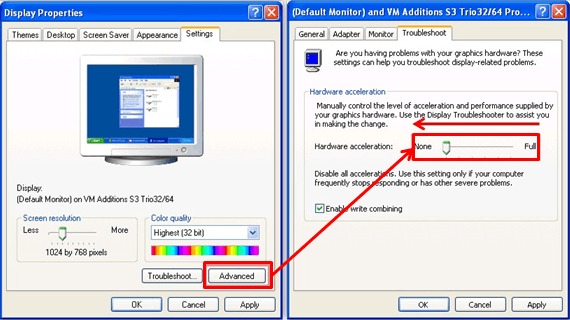 Change the "video acceleration function" setting (Windows XP only). Click the right mouse button on the main screen of the computer, and click the 'Properties' option, then go through 'Display Properties > Settings > Advanced > Troubleshoot, and set to 'None' at the hardware acceleration menu. 6. Restart your computer, and try it again. 7. Re-install the graphics card driver and DirectX, and try it again. The free account can upload up to 2GB or higher.